Does Live Chat Actually Increase Conversions? Last year, all we seemed to hear about was the chatbot takeover but the technology hasn’t lived up to the hype so far. I’ve said before that chatbots have all the potential to change how brands and consumers interact, but this won’t happen until developers stop worrying about the latest marketing gimmick and get back to solving user problems. With the chatbot revolution on pause – at least for now – brands are getting their fix from one of its closest relatives: live chat. This typically involves adding a widget to your pages, prompting users to engage in conversation. The aim is to generate leads, of course, and these things are cropping up all over the web – but do they actually increase conversions? When did live chat become a lead generation strategy? 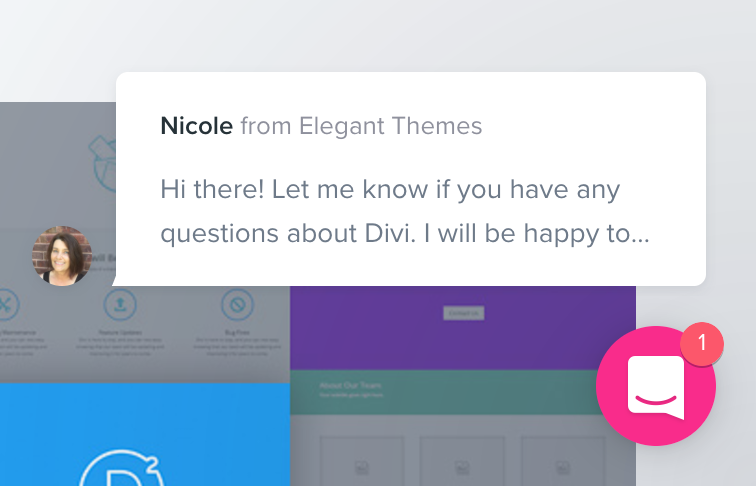 In this case, Elegant Themes’ live chat widget pops up, asking users if it has any questions about its popular Divi theme. These popup-style widgets have become popular over the last year or so and you’ll often find them on homepages and landing pages. This implementation is designed to generate leads – unlike the kind of live chat you get on contact or support pages, where the goal is customer service. The question is: does it really boost conversions? You’ll find plenty of articles answering this question with a resounding yes. Live chat is a big trend right now and a lot of people are keen to hype it up. Before we answer this question for ourselves, though, let’s look at what live chat brings to the table. Why is live chat so popular at the moment? Live chat reaches out to people: It actually prompts users to engage by starting the conversation. It provides an instant response: Users don’t (always) need to wait for brands to get in touch. They can make it easier to find information: If users can’t find the information they need, many live chat widgets can help them out. They offer an engaging alternative to web forms: We know users don’t like filling out forms and live chat creates an alternative. And, of course, you have to credit some of the live chat popularity to the stuttering chatbot trend. Last year, everyone was going nuts about bots and then live chat – which has been around for years – suddenly starts trending. 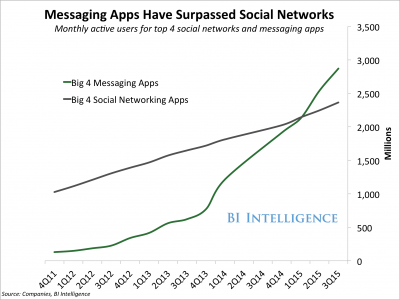 Last year, it was highly publicised that people now use messaging apps more than social media – a large argument for the chatbot revolution. It seems marketers are determined to turn the rise of messaging apps into conversions, whether it’s through chatbots or not. Is live chat up to the hype? In some cases, I think live chat can have a place in lead generation for certain brands. However, like most new trends in marketing, it’s being overhyped and overused in most of the situations I come across. Here are some common problems I’m constantly seeing with live chat on websites. The use of live chat widgets on homepages and landing pages interrupts the user experience, much in the same way popups do. It’s certainly not as intrusive as full-screen popups, but they’re blocking the view of content and they can take up a large amount of screen space on mobile. Your pages have content for a reason: because you have a message to get across and you’ve invested good time and money into designing each page. So it’s a bit counterintuitive to slap a widget over the top of them which steals user attention a matter of seconds after they’ve landed on the page. Again, this isn’t so different to popups that trigger upon page load and those things hardly have a good UX reputation. This is my main concern with how live chat is being implemented on sites at the moment. The reason we have things like information architecture, web design and UX design is because it’s our responsibility to deliver information in a discoverable and engaging way. If users can’t find what they need, without the help of a live chat widget, then there’s something wrong with your design approach – and you need to fix it, not chuck another design trend on top of it. As I say, live chat has been around for years. Remember those horrendous widgets on insurance websites and sketchy IT firms? I certainly do and I also remember hitting the back button at the slightest hint of live chat. It reminds of cold calling, unsolicited emails, popups and other tricks used by brands that don’t have enough confidence in their own products or services to let users make their own decision. Admittedly, the fresh design of live chat widgets looks a lot more trustworthy and the fact we’re so used to messaging apps now could change all this. This is another big concern. One of the most common arguments I hear for using live chat is that it’s “better” than web forms. Again, if this is true, then there’s something seriously wrong with your form designs and you’ll be better off fixing this before adding anything else to your site. Considering how poorly the average web form performs, it’s no surprise brands are screaming out for a better lead generation alternative. But most of the live chat implementations I come across try to cover up a crappy web form experience with an equally crappy chat experience. Here’s an idea: why not try sorting out your forms before adding further barriers to the conversion process? I’m not saying live chat doesn’t have its merits, but using it to replace forms because your form designs are sub-par doesn’t make much sense. I could keep going, but the point is there are probably plenty of ways to improve your forms. Check out this article from Marcus for 58 ideas on how to improve your forms. One not-so-generic piece of advice is to use multi-step forms if you need a lot of info from users. Despite popular belief, various studies show that shorter forms don’t always result in higher conversion rates. However, the more you demand from users, the more friction you’re adding – there’s no getting away from this. Multi-step forms look considerably less demanding because users don’t really know how much info you’re asking for. Better yet, you can design your multistep forms reduce the number of interactions that require typing – the best way you can improve the experience for mobile, among other things. These are the kinds of improvements you should be looking to make before you slap a live chat widget over the top of your website, hoping to increase conversion rates. Live chat is great for customer service but interrupting the user experience in the way so many live chat widgets are starting to do is crazy.